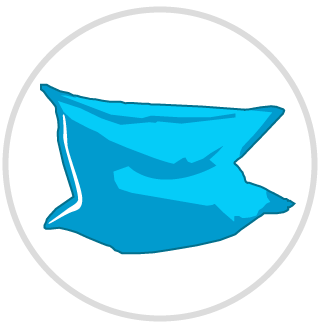 As many rings (ringette rings work great), or balls, bean bags…etc. as you feel are necessary (at least 20). 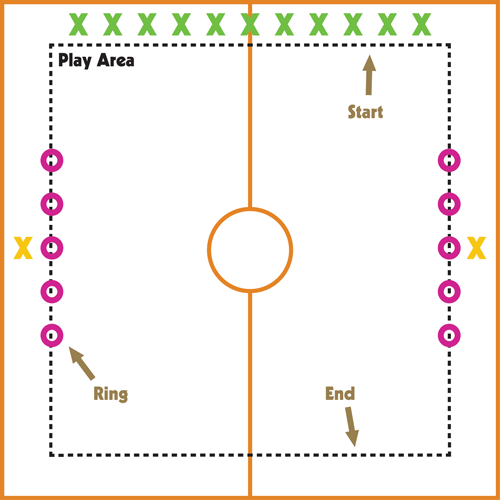 Create a rectangular playing area using either the lines in the gym or cones if you are outside. The playing area should be almost as large as the gym itself. Line up the rings along the two outside lines of the rectangle (as shown in the picture). Have one student stand on the outside of one line behind the rings, and have another student on the outside of the other line behind the rings. Have all other students line up on the end line beside one another. When the teacher shouts “GO,” all students have approximately 10 seconds to cross from one end of the gym to the other without being hit in the feet by a ring (a shooting star). As soon as the teacher says “GO,” the two students standing behind the rings are allowed to kick or throw the rings, so that they slide along the ground, to try and hit the feet of the players running past. Any player who has his/her feet hit by a ring must help to line the rings back up on the sidelines, and must then stay standing behind the rings, ready to fire on the runners in the next round. To change the difficulty level, or if you are playing outside, feel free to use soccer balls, dodgeballs, bosu balls, bean bags (gym only)…etc.